Most of what we’ve focused on for this site has been using LED grow lights as a way to enhance the productivity of the indoor growth of traditional crops, plants, and flowers. They’re great for growing the perfect tomato indoors and when used appropriately they can also help you grow a variety of different flowers for retail purposes. I’m sure there are dozens of other plants and crops you might consider for an indoor grow operation that could most definitely benefit from LED grow lights and what they bring to the table, but not all crops are what you would consider traditional. A nontraditional crop that’s starting to garner a lot of mainstream attention is the indoor growth of marijuana. Until recently this topic was considered a bit taboo, but in more and more jurisdictions medicinal marijuana has been legalized and in some cases even recreational use of the product. And because of its popularity, indoor grow specialists are increasingly turning towards this crop as a great business proposition. LED grow lights can be very beneficial to the marijuana growth cycle and we explain how below. As we’ve discussed elsewhere on the site plants can benefit from different colors in the spectrum at different times in their growth cycle. Specifically, blue grow lights are ideal during the plants initial growth cycle and red lights help when it’s time for the plants to begin flowering or budding. Traditionally in cannabis growth operations growers have relied on two different types of lights for different stages of the growth cycle. They’ve used metal halide bulbs during the initial vegetative growth stage and high-pressure sodium bulbs for the budding stage. The whole process can be quite tedious and expensive maintaining two different lighting systems. By switching to LED grow lights you can have both blue and red spectrum lights in one light fixture potentially saving a lot of money while still giving the plant the different types of light it needs at each stage of its growth cycle. These type of fixtures usually give you the option to switch different bulbs on or off at different times in your plants growth cycle. LED grow lights are also much more economical than traditional lights for growing marijuana. In most cases LED lights can produce the same wattage as traditional bulbs that advertise twice the energy output of the LED grow lights. That means you get the same effect on your plants, but your energy bills are a lot lower. 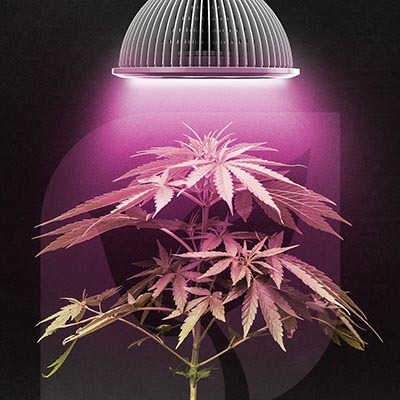 When cannabis grow operations operated on the illegal end of the spectrum that was often how law-enforcement caught them by noticing the strong draw on their electricity grid as the growth of marijuana indoors required a lot of lighting. That wouldn’t have been a problem if they’d had LED grow lights. Cannabis is the type of plant that produces a lot of heat during the growth process and when you combine that with the heat coming off traditional bulbs such as metal halide’s or high-pressure sodium bulbs the end result is an extremely warm atmosphere that’s potentially dangerous as well. LED grow lights produce very little heat and are actually cool to the touch. That means a lot less heat inside your cannabis grow operation and a lot less risk of potential hazards such as those from fire. Another area where LED grow lights outperform their competitors is in the area of longevity. Typically LED grow lights will keep operating for years at a time. If you compare them directly to other popular lighting systems it’s not much of a battle. These traditional lights will typically last no more than 20,000 hours, but LED grow lights will last for somewhere between 50,000 and 100,000 hours. That’s a significant difference and one that more than makes up for the difference in cost. Cannabis is a crop that loves water and when you combine that fact with the tendency of traditional lighting systems which heat up the room to drain the atmosphere of liquids it’s not necessarily a match made in heaven. As we’ve indicated, LED grow lights give off a lot less heat and do not significantly affect the moisture in the atmosphere or in the ground of your grow operation. That means almost all of the moisture you add to the system goes to your plants and you can save a lot of money by reducing your H2O bills. One more area where LED grow lights can save the marijuana growth operation considerable money is in infrastructure costs. Traditional lighting systems such as metal halides and high-pressure sodium systems rely on costly ballast systems distributed throughout the grow op which are expensive to put in place and maintain. LED grow lights by comparison are much lighter and don’t require the same type of infrastructure. It’s just one more way that someone growing cannabis or any other crop for that matter can save money. There are quite simply many different ways that LED grow lights can save the marijuana grow up money over time. They reduce your infrastructure costs, lower your energy bills, reduce your water bill, and are generally safer to operate. Many marijuana growers actually believe that the LED lights increase their crop yields due to their efficient nature. Whether this is true or not may still be up for debate, but there’s no doubting that they hold many advantages for the marijuana grow op.